For some weeks I have been playing around with a Boss RC-50 loop station. The RC-50 allows you to record your own playing and play it as a loop. This way you can create multiple sound layers, and then jam to it. A really nice tool that makes a lot of fun. Here I am live recording a rhythm guitar and a bass over a drum rhythm from the RC-50, similar to the groove of In the Gallery from Dire Straits’ first album. The guitar is a part-o-caster with an old Squier body and neck , the bass is an old Precision Bass. Everything was monitored over a Music Man RP 112 RP amp, and recorded with the microphone of the video camera. There are no effects except some reverb from the amp. Ha HA! I really got into this Ingo, really great stuff. Your Partsocaster is very similar to my own only I have a Rosewood neck. Lovely playing as usual, thanks!! I just wonder : when you roll up or down your volume poti, it doesn’t affect so much the guitar volume. At least, I don’t hear much difference. 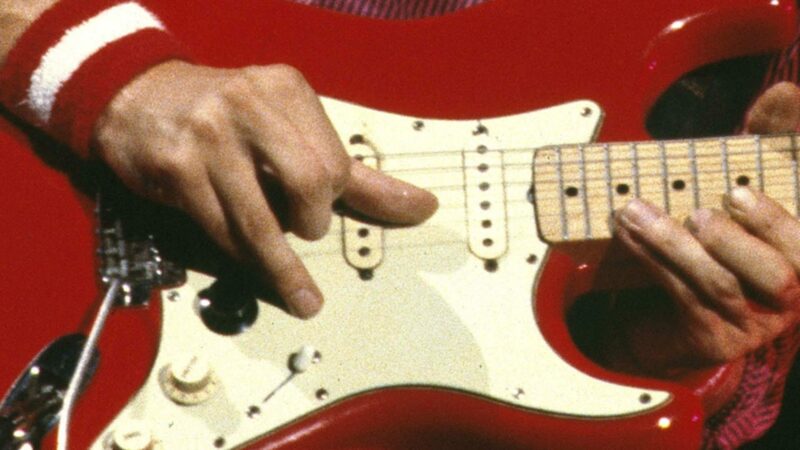 Do you turn it up just only few notches, or is the curve different as on a “normal” strat ? >>when you roll up or down your volume poti, it doesn’t affect so much the guitar volume. There is no volume control on the guitar (I use the foot pedal for this). The middle tone poti is a rotary switch that allows a lot of unusual pick-up combinations, e.g. humbucker-like serial sounds. The black knob is a blender poti with which you can gradually blend from the standard strat sound to the selected humbucker sound. I often use it just to add a bit of warmth to the strat sound, or to make it a bit fatter, just as it feels right for the moment. Nice item 😀 can I ask you what chords are in this song? I noticed that you play in Am from that other in the gallery item, and it makes sence. It’s too shame that they didn’t record the song all over again in Am but then faster played. I like the original Am but I like the speed just as much. Wow dude, you’re really talented! Great guitar work. Beautifully done. Nice one!.. I’ve always wanted to play guitars but it’s really hard because I’m left-handed. He he he.. I love Dire Strait’s “Romeo and Juliet”. You rock!